Sound Smoothly detailed, with a large soundstage and terrific spaciousness; bass is deep, but will be too much for very small rooms. Features Sturdy construction and gorgeous finish; grilles, plinths and stainless-steel spikes included. Use Detail and soundstaging benefit from only moderate toe-in; intended primarily for bi-wiring/bi-amping applications. Value Certainly not cheap, but when retrieval of detail and spaciousness are considered, they are a great value. 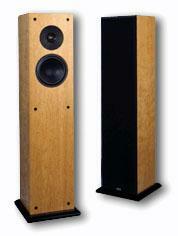 I dont know about you, but I adore floorstanding loudspeakers. Ive heard a growing number of bookshelf and stand-mounted speakers that have really floated my boat, but in the end, Im afraid the audio-toy hunter in me would feel like hes settling for anything less than a pair of impressive floorstanders. My informal research (involving two cans of beer and a legal pad) has shown that most audiophiles secretly dream of a large, elegant room with massive, multi-driver floorstanding loudspeakers driven by gigantic solid-state amplifiers capable both of deafening all within a 50-mile radius and using enough energy to power the London Underground. Im pretty sure that even self-professed tubeheads secretly crave this sort of over-the-top indulgence, even if for no other reason than to impress friends and mates. As with any good thing, however, there can be a number of serious drawbacks. Floorstanders tend to provide the more full-ranged sound that so many of us ex-dorm-thumpers crave, but often at the expense of the refinement, clarity, and imaging that smaller speakers seem to provide so effortlessly. In addition, it can be much more difficult to integrate a pair of quality floorstanding loudspeakers into our real-world listening environments; bigger speakers normally demand a great deal of space, and finding the optimal placement within less-than-optimal listening rooms can be pure hell. Finally, as we progress further into the joyful realm of audiophilia, many of us find that those few floorstanding speakers capable of merging imposing presence and superb bass with clarity and great imaging cost more than the humble audio budget of your average Joe music-lover. In the end, are we destined to reside in the land of either-or? Cant we find a way to bridge this gap? When will the suffering end? Nova Audio, a high-end speaker manufacturer based in Texas, thinks they have just the thing to bridge the gap. A number of their speaker models have already been reviewed in SoundStage!, ranging from the massive Rendition to the stand-mounted Ovation. With the Bravo, however, Nova is taking on a difficult market segment. Although Novas cheapest floorstanding speaker, the $3300/pair Bravo raise expectations for performance, but they dont allow for the truly lavish treatment required to provide the best of both worlds -- state-of-the-art sound and a reasonable price, that is. How does the Bravo meet this challenge? One advantage of approaching a design like the Nova Audio Bravo comes from the expertise developed in cost-no-object designs, like the companys Evolution II. Indeed, many of the same technologies have been adapted to the Bravo. The Bravo uses a two-way vented driver design. The 7" midbass driver is based on that in the more expensive Evolution II, and is constructed from carbon fiber. According to Nova, this material allows the driver to be both rigid and very light, allowing it to more accurately track high-speed dynamic transients. The driver is secured in a rubber surround and uses a long-throw suspension, surrounded by a magnesium basket. Magnesium, again, was chosen for its low mass and high rigidity, and has the additional benefit of being (as described on the Nova Audio website) "acoustically dead." The driver is vented via a long, thin port located on the bottom of the rearmost cabinet panel. The Bravos tweeter is a 1" soft-dome design, again with a long excursion and mounted with a large aluminum front plate, with dual rear chambers for pressure release. The Bravo uses an acoustically fourth-order Linkwitz/Riley crossover, and offers a claimed bandwidth of 33Hz to 20kHz. While it is a rather easy load to drive (8 ohms nominal impedance, 6 ohms minimum), it isnt terribly efficient (87dB), so youll want a fair amount of power to get the best out of them. Nova recommends a minimum of 30 watts. When the pair of Bravos arrived, my first impression was one of mass. I live in an upstairs apartment, and my UPS driver is getting rather frustrated with the frequent comings and goings of large, heavy boxes that go with having an audio reviewer on your route. On the day of the Bravos arrival, I attempted to garner his favor by offering to help carry the speakers upstairs. My sore back and exhausted pallor soon testified to the heaviness of the speakers, and to the quality of their protective shipping cartons. Once finally extracted from their boxes, the Bravos cut a striking figure. Though they may be Novas smallest floorstanding speaker, 42 1/4"T x 9 1/2"W x 9 3/4"D, they were still significantly taller than my PSB 1000is. Their profile shares the thin design of the PSBs, though the similarities end there. According to Nova, the Bravo is constructed from thick wood panels, with solid internal bracing. Each speaker is moderately heavy (58 pounds apiece), and my traditional knuckle-rapping test revealed a solidness and rigidity far beyond that of any other speakers in my current review stable. In fact, Nova recommends (and I strongly concur) that the speakers only be unpacked with assistance; your back will thank you, and youll be far less likely to do damage to your home or your new loudspeakers. Most impressive of all was the Bravos fit and finish. They appear almost as though they were hewn from massive solid blocks of wood. The veneer is pristine and exquisitely applied, giving the Bravo an appearance that would allow it to serve as fine pieces of furniture in any décor. The Bravo includes tall, rigid grilles, but I found the speakers simply too beautiful to leave grilled during listening, and Im certain that anyone who sees them would feel the same way. For the actual listening portion of the review, I relied on my normal stable of equipment. Parasounds estimable CD/P-1000 integrated CD player handled front-end duties. Volume control was provided by the McCormack TLC-1 line-stage preamp run solely in passive mode -- it wasnt even plugged into the wall for the course of these reviews. I also had an opportunity to use the Alternate Audio BCAP for preamplification, though I normally fell back to the somewhat more revealing TLC-1. Amplification was taken care of by the McCormack DNA-1 and the excellent Alternate Audio CA35. Interconnects included the Kimber HERO, Cardas MicroTwin, and JPS Labs Ultra Conductors. Kimber 8TC, Cardas TwinLink-A, and JPS Labs Ultra Conductor speaker wires were used too. Concrete paving stones acquired at a local building center were used both as amp stands and under the Parasound player. The CD player and linestage (and paving stone) rested on a Michael Green Designs Justarack, in natural cherry. All electronics that required power were plugged directly into the wall outlets, without the use of surge protection, filtration, or shorting plugs. All connecting surfaces were treated with Caig ProGold and XLO TLC wipes. Invaluable assistance was, once again, provided by my good friend JP, while Gabby the Audio Cat provided second opinions and white noise. Setting up the pair of Bravos in my listening room wasnt quite as simple as unboxing them and connecting them to the amplifier. They include a set of short, yet solid, wooden plinths that bolt to the bottom plates of the speakers. The stands, in turn, accept a set of spikes, upon which the entire construction rests. My review samples included a set of hefty black spikes, which were later replaced by a set of even sturdier stainless-steel spikes; the stainless models are now, according to Novas Kevin Lee, standard on all Bravos. Each Bravo has two pairs of well-made gold-plated five-way binding posts, and as such, are ready for bi-wiring or bi-amping. In fact, Nova recommends that the speakers be used this way -- a jumper is not included, though you can request one if you simply cannot bi-wire (or wish to use an internally bi-wired set of speaker cables). Placing the Bravos in my listening room was significantly more tricky. The excellent owners manual (for loudspeakers, anyway) recommends a room with a dimensional ratio of 1 x 1.6 x 2.6, with at least three feet between any rear or side wall and the speakers themselves. Above all else, it is recommended that the owner avoid placing the speakers in a room with equidistant dimensions (sound advice for any loudspeaker, especially floorstanders). Sadly, as you may know from earlier reviews, my listening room violates nearly all of these recommendations, with dimensions of 10'W x 12'L x 8'H. Following these recommendations, and standard calculations for placement of the listening chair, I would find myself in the extreme (and I mean EXTREME) nearfield of any speaker, with results too horrifying to mention. After much experimentation, I once again fell back on my current favorite, recommended to me a while ago by Doug Blackburn: firing the speakers diagonally out of a corner. Doing so nearly eliminates reflective interactions from side walls, helping to provide excellent imaging. Unfortunately, any speaker with deep bass response (particularly that of the Bravo, with its rear-mounted port) suffers from the proximity of the walls and the sheer size (or lack thereof) and dimensions of the room itself. I found the best compromise I could by placing the listening chair as far back into one corner as practicable, with the speakers firing directly toward me from the opposite corner, split roughly four to five feet from one another. Imaging and space were optimized by using moderate toe-in, with the speakers firing not quite directly at me. Pulling the speakers forward as much as possible without placing me in the extreme nearfield helped to minimize detrimental effects on the bass. Ive had the Bravos for a few months, and through occasional break-in sessions performed while I was at the office (cant disturb the neighbors too much), I was able to run them for over 250 hours before performing serious listening, though I sneaked in many a pleasurable listening session before reaching that point. Nova recommends a minimum of 100 hours of break-in for a new pair of Bravos, with maximum performance reached at the 500-hour mark. During those first listening sessions, my most powerful initial impression of the Bravo was one of extreme smoothness. The Bravo simply lacked a great deal of the grain and harshness Ive come to expect from audio gear. This smoothness was never exhibited at the cost of detail, however -- I began to hear new details in recordings that I had never before discerned. As the speakers broke in further, the impression of smoothness remained, though it was tempered as the Bravos became more and more revealing. At the upper end, the speakers displayed exquisite, lifelike detail without ever becoming harsh or overly forward. The Bravos treble does exhibit a fair amount of sparkle, but without a hint of spittiness or garbling hash. In contrast, the high end of the Ohm Walsh 100s seemed to exhibit a slight sense of grating sibilance, while the PSB 1000is were unpleasantly grainy and spitty. The Bravos midrange is extremely clear and seductive, with a tactile presence that Ive never before experienced in my system. To restate a cliché that has been brutally overused in the high-end press: listening to music via the Nova Bravo provided the same sensation as, say, cleaning a filthy television screen. With the TV, colors and image detail suddenly rebound and come to life. With the Nova Audio speakers, the same happened with midrange instrumental and positional detail. Instruments simply sounded more real, and more like instruments. Of the two comparison speakers, the Ohm probably best compared to the Bravo, though neither the PSB 1000i nor the Walsh 100 could match the Bravos liquid, unveiled midrange clarity. Bass performance was, as noted above, somewhat difficult to discern in my room. The Bravo was able to produce more deep bass with more instrumental detail (on, for example, a walking bass line) than other speakers without overloading (more on this in a minute), but the bass was at times simply too much for my room, causing an overpressure that loomed and throbbed, often damaging even the midrange clarity. However, this happened less frequently than with other floorstanding loudspeakers in the same room; the Bravo was able to discern more and deeper bass detail than their rivals, easily outperforming my previous bass champions, the PSB 1000i. As a confessed detail fanatic, I found nothing to complain about with the Bravo. As I mentioned, I discovered instrumental details that had not yet been revealed to me in many recordings, not even by the surprisingly detailed Ohm Walsh 100 Mk 2. When the Bravos were properly positioned, the soundstage they threw was as wide and deep as any Ive experienced in my room. The Ohms, previous kings-of-the-hill in soundstage size in Chez Causey, provided perhaps a tad more front-to-back depth, but the Bravos matched them in width, and greatly exceeded them in height and projection in front of the speakers plane. Additionally (and interestingly), the Bravo provided a more "traditional" soundstage, shaped like a rectangle, in contrast to the Ohms arc-shaped soundstage presentation. Most impressive of all the Bravos significant sonic characteristics was their powerful sense of space. Many (if not most) audiophiles subscribe to a belief often credited to The Abso!ute Sounds Harry Pearson, which states that the ultimate measure of a systems sonic qualities is how well it compares to the sound of unamplified music in a live venue. For me, the most underrated (and rarely achieved) aspect of this "liveness" is the sense of space presented by a system; without that rich, tactile sense of "being there," even the most accurate and dynamic presentation will never truly bring you in touch with the music. In this regard, the Bravo is simply flooring; many of its sonic characteristics are quite in line with what you would expect from a speaker of this price range, but the Bravo provides a sense of space and "thereness" that I have only heard once before in an audio system, and that other experience with a pair of loudspeakers priced at nearly five times the Bravos $3300. On Diana Kralls All For You [Impulse! IMPD-182], I could close my eyes and come within a hair's breadth of believing that Krall was really in my room. The instruments spread accurately across the soundstage, with her vocals placed dead-center in front of me, her honey-sweet voice crooning "Im An Errand Girl For Rhythm" right into my entranced ears. Likewise on Buena Vista Social Club, by Ry Cooder and friends [Nonesuch 79478-2], a spacious album in its own right. I was projected right into that Cuban recording studio. Percussion instruments were impressive, but vocals and piano were simply jaw-droppingly realistic, with a sense of body and presence that helped me to lose myself completely in the music. On both of these albums, the sparkly, rich highs only added to the magical mix. Even the bass, which I had often struggled with, was quite good, with the walking bass lines on the Krall disc in particular coming across in a rich, detailed, and clean manner. With the recent release of Star Wars Episode One: The Phantom Menace, I have been once again on a Star Wars kick, so I dragged out my collection of Star Wars soundtrack albums. The Bravo continued the magic previously shown on jazz with these orchestral works, providing all the power and majesty of John Williams brilliant soundtrack to Return of the Jedi [RCA Victor/BMG Classics 09026-68748-2]. The power and blattiness of horns, the smooth, rich majesty of strings, the power and detail of percussion, were all there. Another reviewing (and listening) favorite of mine is Dead Can Dances live album Toward The Within [4AD 9 45769-2]. The always-haunting solos of Lisa Gerrard, as on "Persian Love Song," reached a level of frightening passion on the Bravos; with the music set to a realistic volume level, I was genuinely shaken up by her vocal power and passionate delivery. Brendan Perrys vocals were equally moving, though the deep bass on tracks such as "Rakim" was occasionally too much for the Bravo/small-room interaction. Instrumental detail was simply brilliant, with the sparkly highs truly bringing out the incredible array of instruments used in Dead Can Dances live performance. The Bravos extremely revealing nature did not serve all recordings as well, however. On George Michaels Ladies and Gentlemen  The Best of George Michael [Epic E2K-69635], the improved quality of remastered singles was evident, but the harsh, compressed, radio-centric mixes were still quite clearly revealed as well, as with "Freedom 90." The Bravos clear nature means you hear every wart of a bad recording, but they are not so merciless that its simply impossible to enjoy poorly recorded guilty pleasures. While not as capable of making the bad sound tolerable as, say, the Ohm Walsh 100, with the Bravo you can still live with your collection of early 80s CD releases without going mad. The Bravos ability to penetrate to the heart of an albums sound was a good thing in more ways than one -- not only did good recordings provide detail and dynamics heretofore unheard, but the speakers could even provide me with unexpected pleasure in recordings whose good sound I had discounted. Case in point: Madrid, by smooth-jazz sensation Marc Antoine [GRP GRD-9926]. Im not a terribly huge fan of smooth/lite/breeze jazz, but theres an occasional gem amongst the dentists-office crowd, and Madrid is certainly one of those gems. While not marked as an HDCD, Madrid shares the almost aggressively clear sound Ive come to expect from other HDCD-encoded jazz albums, with only a moderate hint of overtly aggressive treble. "Sunland" and "Concache" best highlighted the Bravos sonic merits. One note on equipment-matching: though the Bravo is relatively inefficient, dont rule out the use of high-quality, if low-powered, class-A amplification. The relatively diminutive (physically, anyway) Alternate Audio CA35 amplifier worked together with the Bravo like a champ, with detail, cleanliness, and soundstaging that were just, well, heavenly. In case I wasnt clear, I loved the Nova Audio Bravo. It could be argued that you should love any speaker that costs over $3000 a pair, and the Bravo did not escape the Audiophile Law of Diminishing Returns -- it was not three times better than, say, my reference PSB 1000i. It was, however, a significantly better speaker than any other reference I had on hand. More importantly, the Bravo has a quality that I think completely belies its price -- its presentation of space and musical "reality," if you will. Ive experienced a number of speakers that cost less and more (sometimes significantly more) than the Bravo, and the Bravos sense of space bested all of them, and stayed competitive with even the most expensive. While Im certain that there are many speakers at higher price points that compete with the Nova Bravo in this critical regard, there are also many that dont, which is high praise indeed for the Bravos designers. Perhaps my friend JP said it best; while listening to the system of Alternate Audio CA35, Nova Bravo, and JPS Labs wire, he said "This is one of the best systems Ive ever heard at any price." If youre in the market for loudspeakers at any price range and have a large enough space to truly let the Nova Bravos bass performance cut loose, I suggest -- no, implore -- that you to listen to this speaker. But do it only if you can afford a pair because once youve spent quality time with them, youre not likely to want to let them go. Price: $3300 per pair USD (available in light oak, black oak, natural cherry, and sapeli finishes).